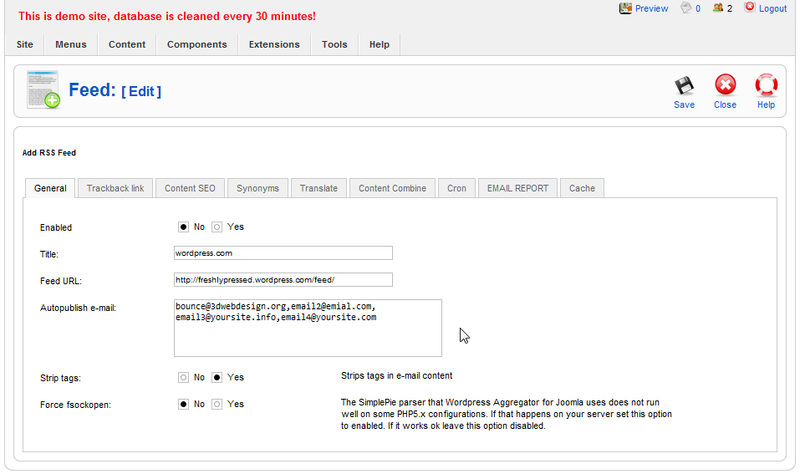 Wordpress Aggregator Ultimate for Joomla is professional SEO tool, component that can post simultaneos in many websites over email and xmlrpc. Component can post in any blogger, wordpress and others blog cms with "post by email" support (xmlrpc is supported only for Wordpress blogs). 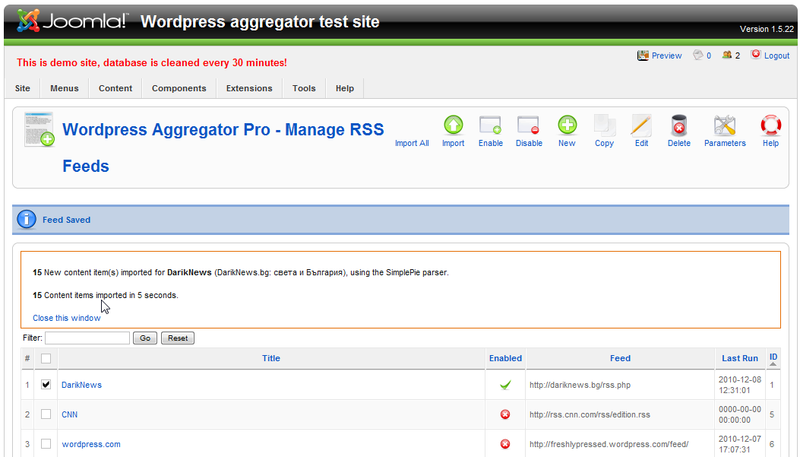 Wordpress Aggregator Ultimate have Scraper (grabber) and many seo functions and is 100% Google Penguin Friendly! 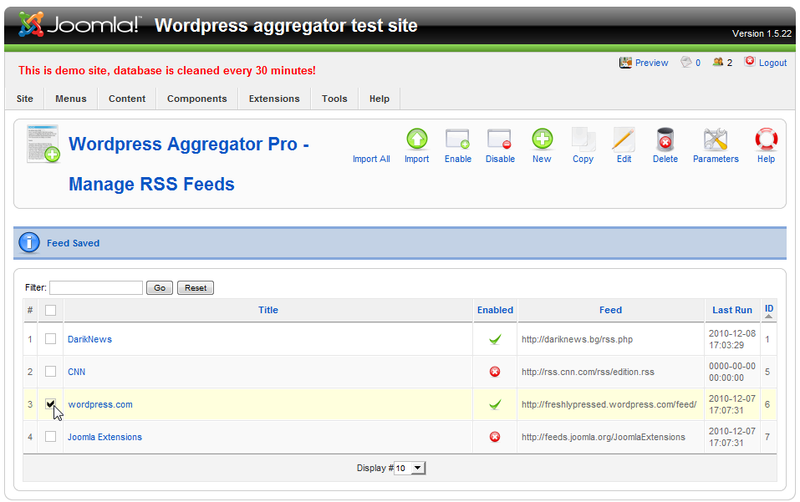 WP Aggregator Ultimate have two versions - for Joomla 1.5 and Joomla 2.5. 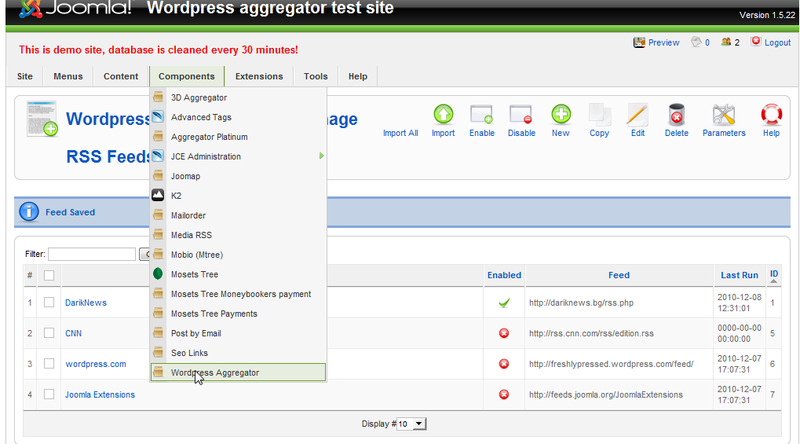 Latest versions are: for Joomla 1.5 - WP Aggregator Ultimate 1.5.5. 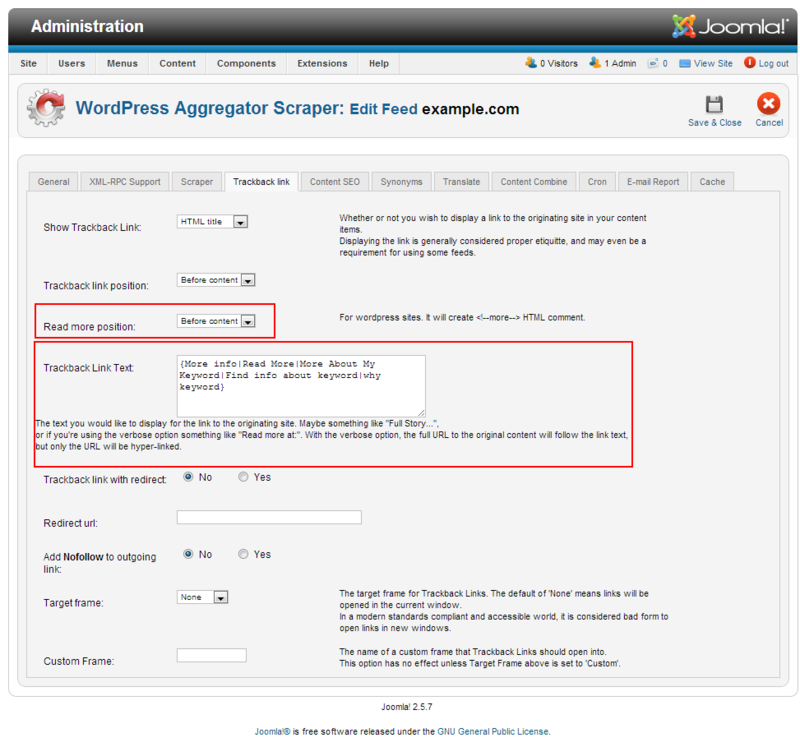 For Joomla 2.5/1.7 - Wordpress Aggregator Ultimate 1.6.8. 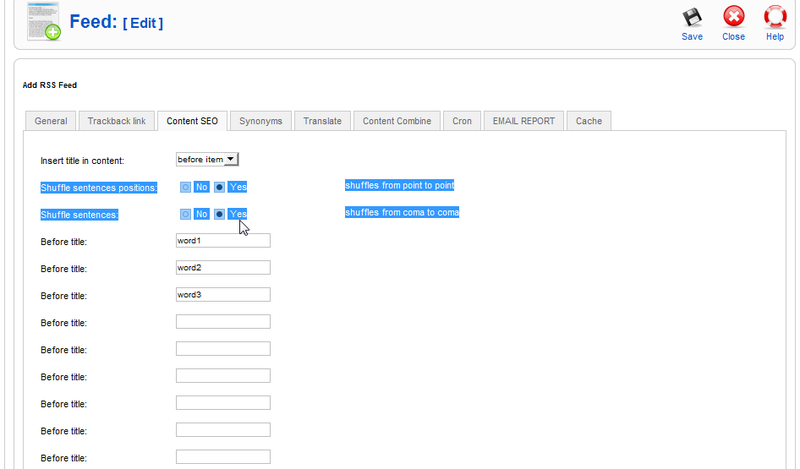 WP Aggregator Ultimate now work with big synonym databases from text file! 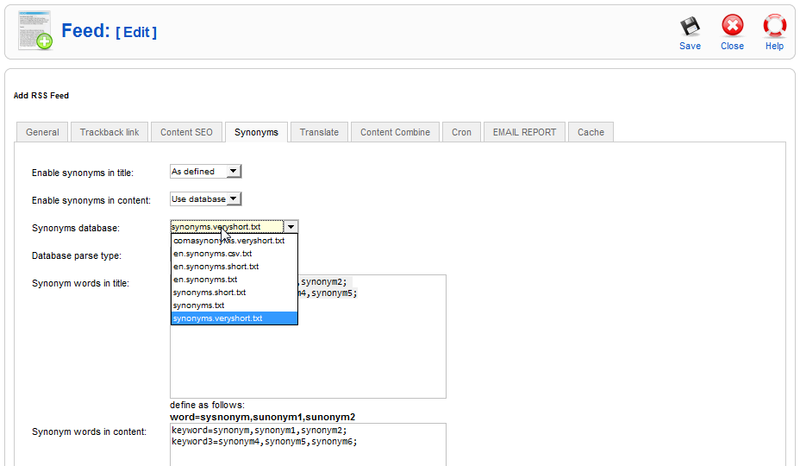 Included in package are: English synonyms database with about 60000 words and scraper plugin. Google translate function is not working, Google translate is now paid service! WP Aggregator Ultimate is Seo tool with article spinner inside - is Joomla extension that can generate unique texts from rss feeds and to post result simultaneously in many blogs at once. This unique content generator can work with unlimited number of rss feeds and post automatically in unlimited number of blogs after simple configuration of cron job task. This Extension is for Joomla CMS. Content is not saved in database - is sent by XMLRPC or over email. Content can be sent in HTML format or as plain text to Joomla, WP, Blogger, Typepad, Status.net or any related CMS that support posting by email. 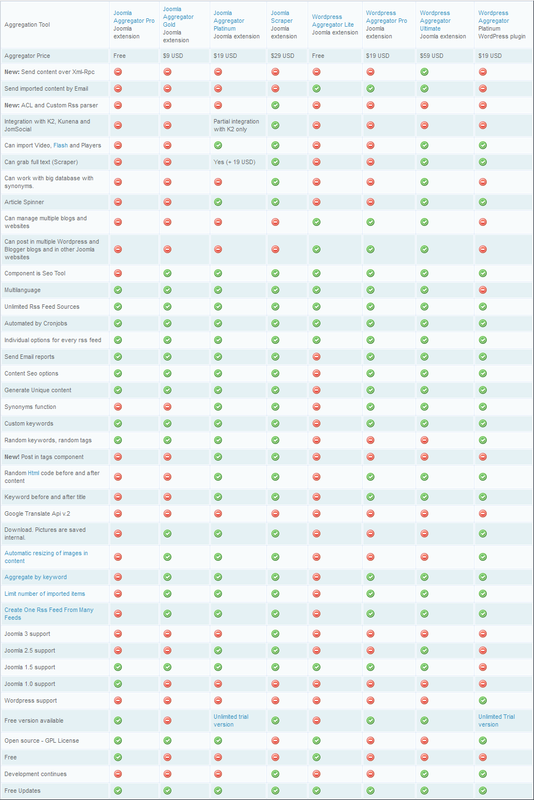 Why only Joomla 2.5 is supported? There is no sense what version of Joomla can be used for this install. The idea of this SEO software is to install it in standalone install somewhere and to use this CMS installation only for this tool. Tool can grab content from huge number of sources and post content to many external sites at once and this needs power. VPS is recommended for best results. 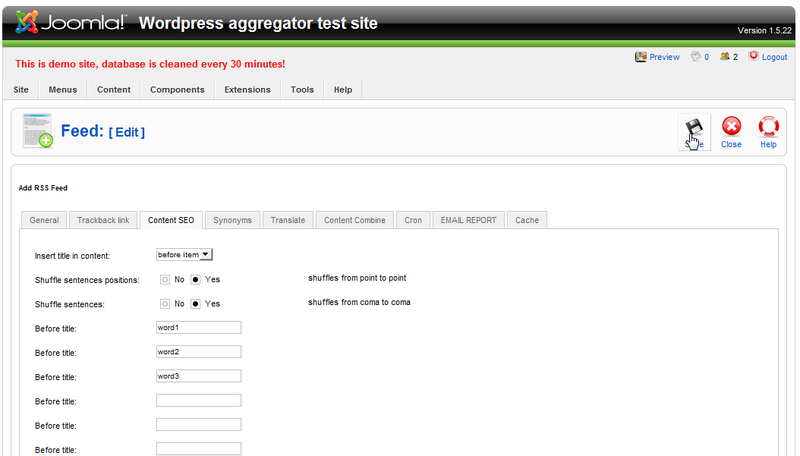 Ultimate is Top version: have all functions of WordPress Aggregator Pro and about TEN more options. V.1.6.8 and 1.6.9. Keyword filter. 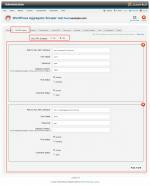 Item will be imported only if some of keywords is find in title or in content body. V.1.6.7 is released. Several new functions inside. 1. Preview imported items (preview before import). 2. Limit number of imported articles. 3. "Read more" link position (only for WordPress) and "spin-formatted" text before it. 4. 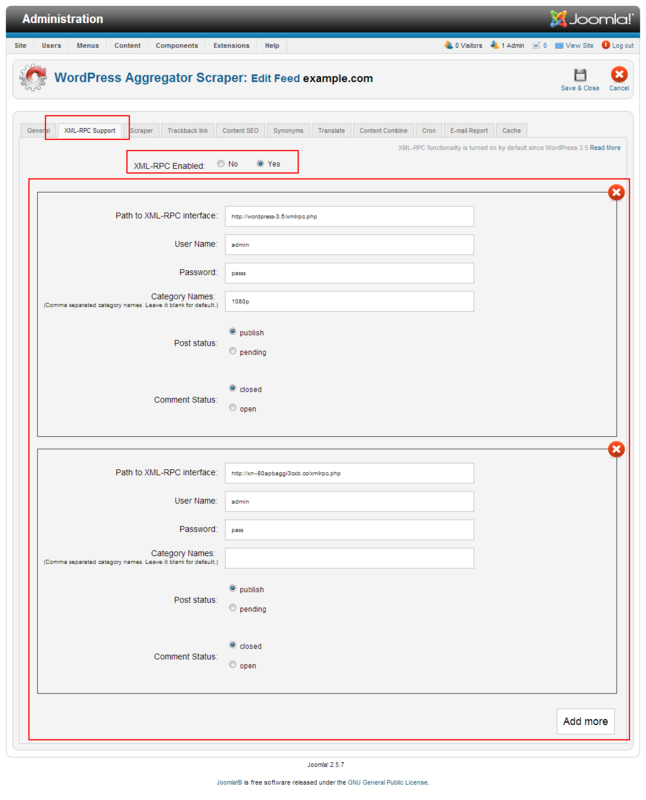 Wordpress XMLRPC support instead of sending content only over email. You must configure url of blog, category, username and password of admin account and content will be published immediately. 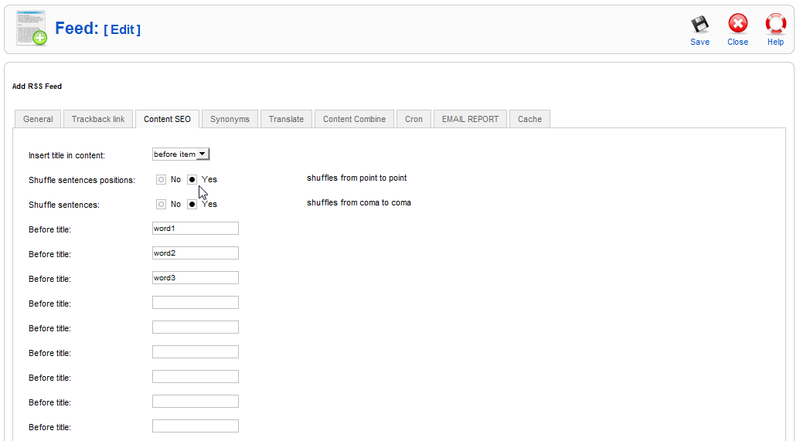 Spin format support with html support in "before title", "after title" , "before content" and "after content" fields. 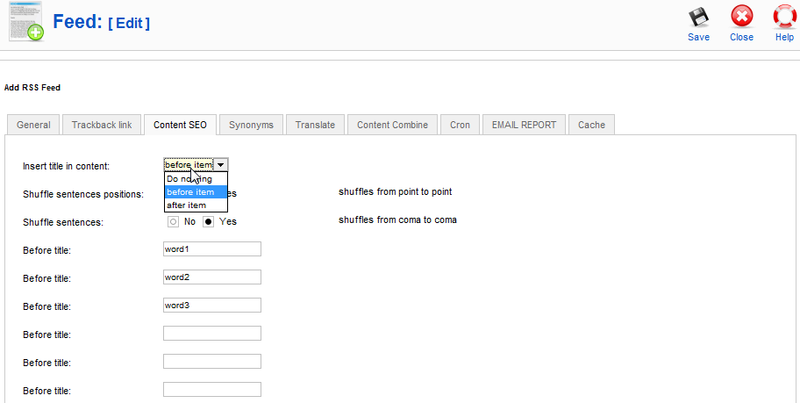 English synonym database inside. 17000 words and their synonyms - about 60000 words. Scraper plugin is included in this version. With scraper you have grabber functions - you can grab full text, not only content in rss feed. Read more link to full story can be over redirect. You will receive in package redirect php code for wordpress. 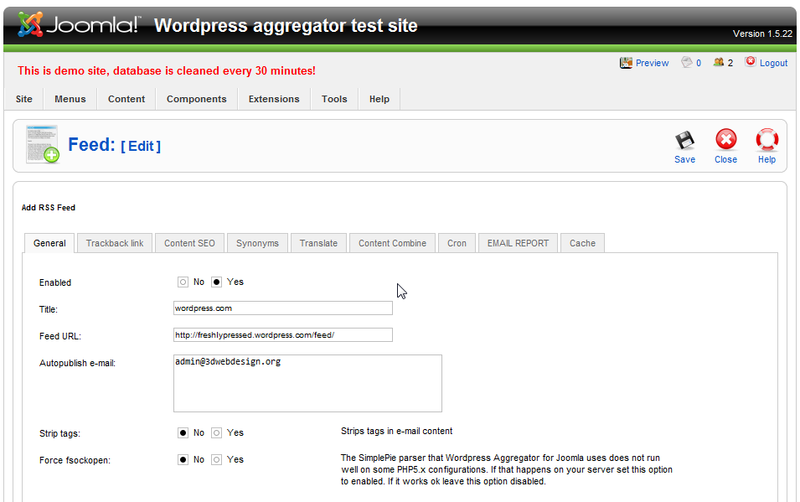 Just upload to public_html of your wordpress blog and configure aggregator to use them. 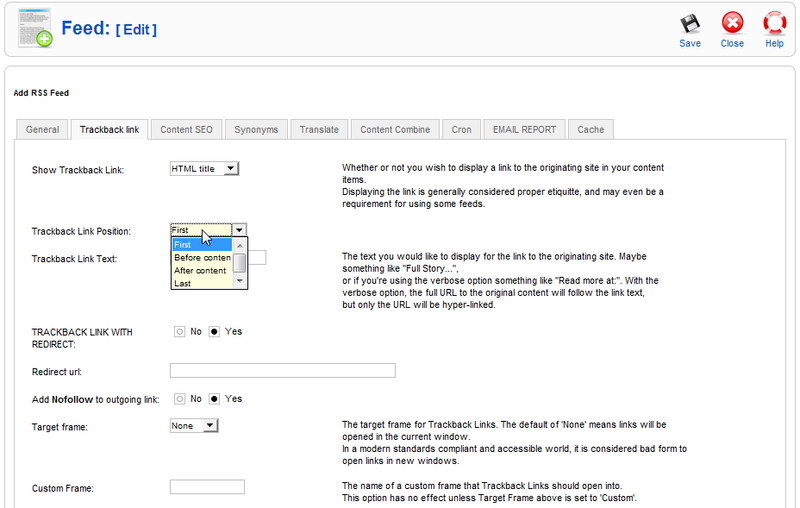 More fields in Content seo tab. Before title are 20, after title fields are 20 too. This will give you 20x20=400 combinations of titles for every content item in rss feed. Before item fields are now 30, after item fields are 30 also. This will give you 30x30=900 combinations of content inside every content item. You can enter in Email field many emails. Aggregator will send content simultaneously at all emails and content can be posted in many websites. Function to add one more time title in content. 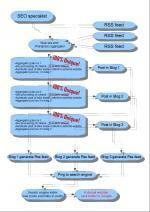 This option is added for seo optimization and to achieve keyword density in post. Options are before content or after content. Post in multiple websites at once. Content can be sent to unlimited number of domains. Generate 100% unique content automatically over your rules. 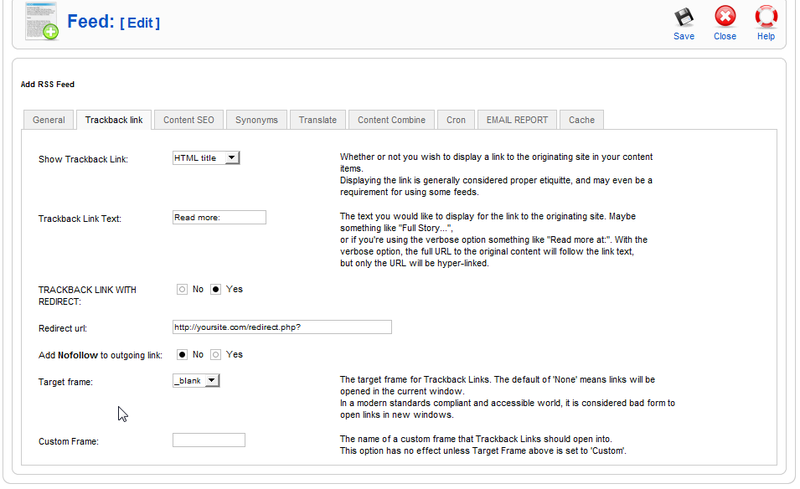 If you configure for some feed to be imported in many websites, in every blog will be posted different content! 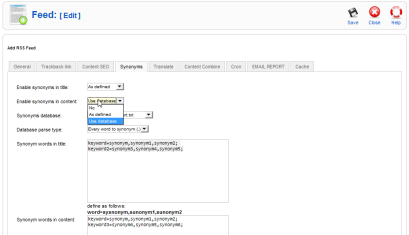 Synonym replacement function over synonyms databases. 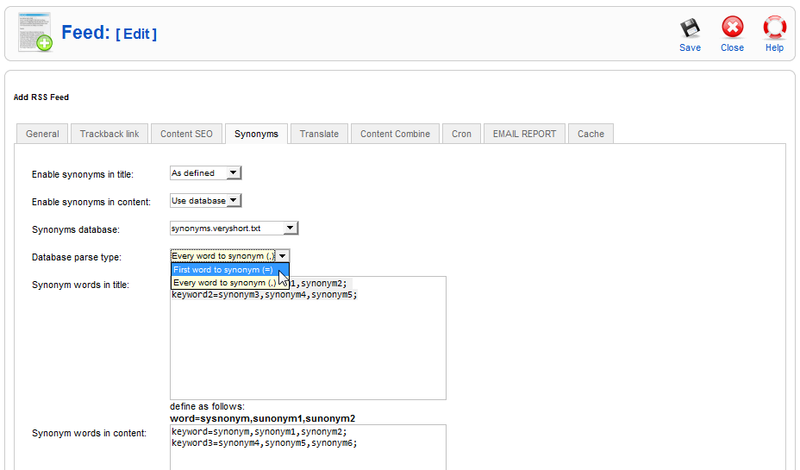 Work with many databases with synonyms loaded in Joomla database. 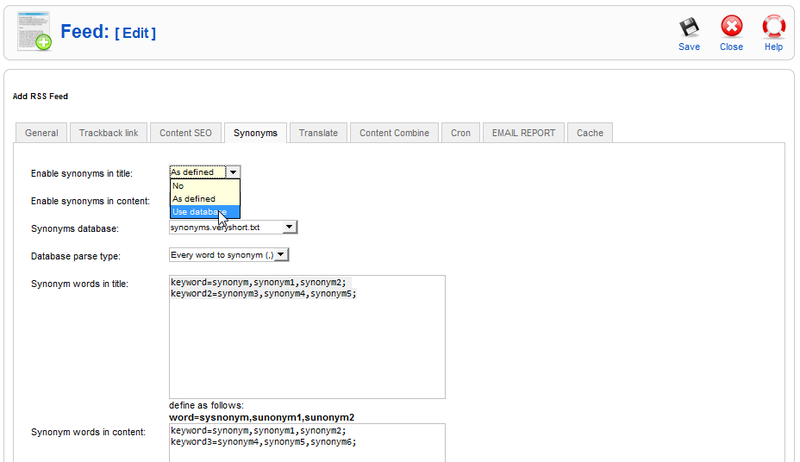 Every rss feed can work with separate synonym database. Can add and change html code before/after every post. Random choice of html code to add. Translate rss feeds from/to 80 languages over Google translate. Automated over cronjobs. Every rss feed start and content is sent to some website by your schedule. 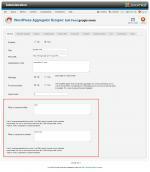 One copy of Wp Aggregator can post in min. 1000 blogs. One hundred blogs is recommended number for shared hosting, over 3000 are possible if VPS is used. With one click you can post one rss feed in many different blogs. Content will be not duplicated (search engines do not recognize them as duplicate), and in every blog will be posted different content! Posted content that will be unique, changed over your rules. 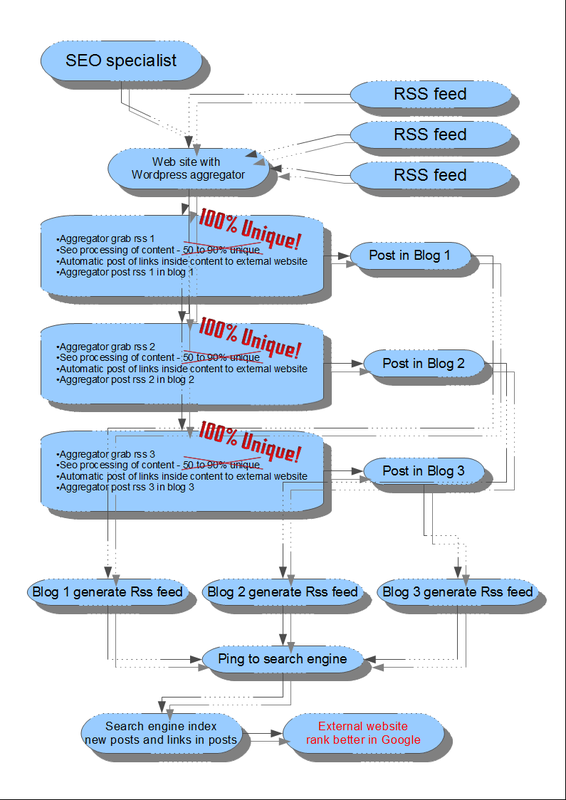 One component can manage multiple blogs over unlimited rss sources. All is automated over cronjobs. Every rss feed is started by your schedule over cronjob. And in any other blog system that support post by email. 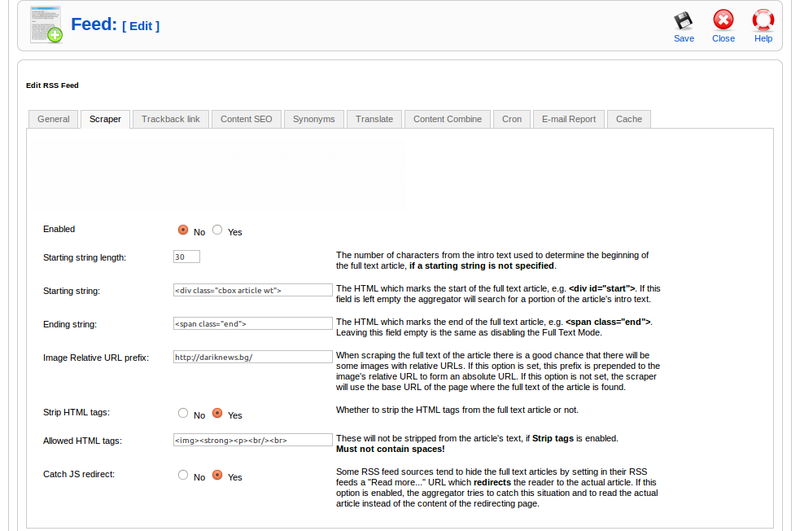 Where can post WP Aggregator pro: List with over 400 websites with post by email functions. One aggregator component can manage multiple blogs over unlimited rss feed sources and every rss feed will work automatic by your schedule over cronjobs. WP Aggregator Ultimate can create unique content over rules entered by You from many options list. You need latest Joomla 1.5.x or Joomla 2.5.x and PHP 5.2. to PHP 5.4. Cron functionality is required for automatic work of component. Access to php settings of host ( over php.ini ) is required in some cases. Recommended: memory_limit: min. 64 MB. 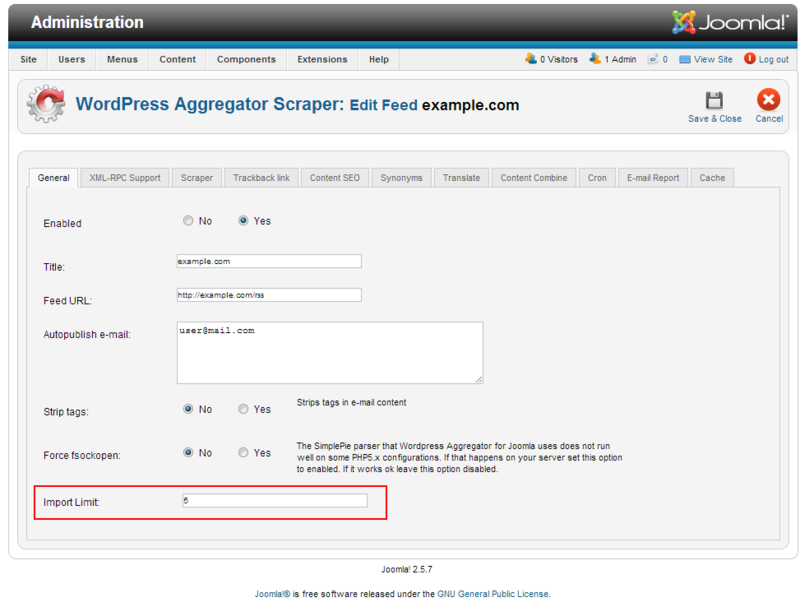 Documentation: Wordpress Aggregator Ultimate FAQ - description of functions - english. License is for ONE Domain. You can use our Component on ONE Domain and on all its Subdomains. Price for ONE License - 39 US Dollars, Epay.BG and PayPal Payment. Please, fill domain name for license in comments! 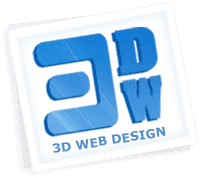 Privacy: 3D Web Design will never disclose any details of customers who bought this Seo tool but may disclose how many customers bought this item. 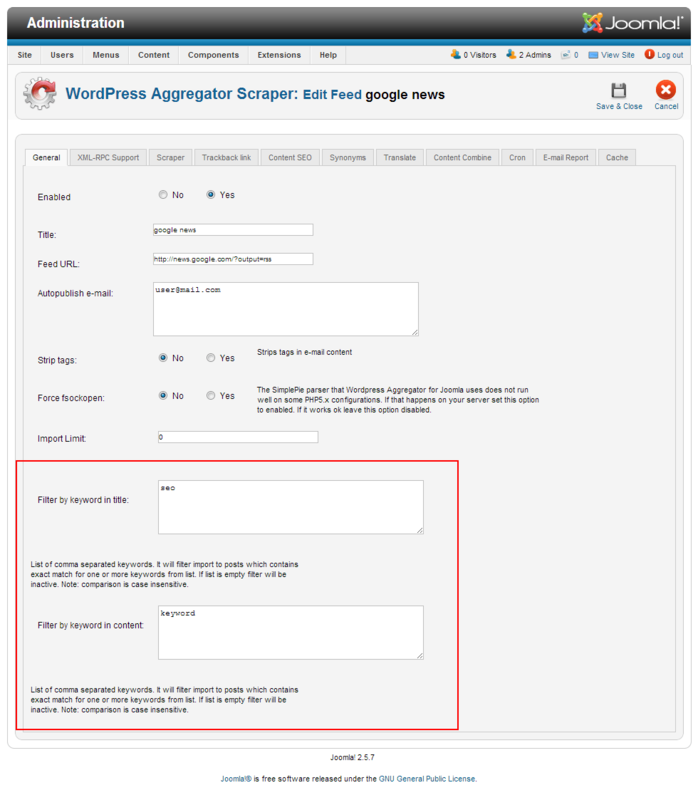 Wordpress Aggregator Pro is without scraper and article spinner and cost only 19 USD.